9 carat Gold Fancy design bracelets and Cubic Zirconia semi-precious Stone set bracelet designs. Ladies bangles and bracelets with intricate fancy designs or with sparkling CZ stones all set in 9 carat Gold. 9 carat White Gold Bangle set with Brilliant CZ stones. 9 carat White Gold Heart Bracelet set with Sparkling CZ Stones, 180mm length. 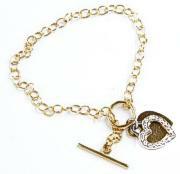 9ct Gold T Bar Toggle Bracelet set with Gold Heart Tag and CZ set Open Heart Tag. approx 190mm bracelet length. 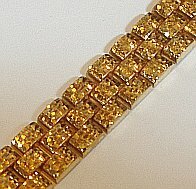 9 carat yellow Gold Ladies textured Gold Nugget diamond cut finish 17mm wide bracelet. Stunning design and textured finish! 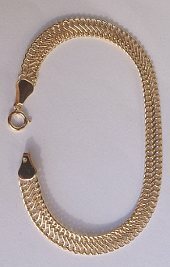 9 carat yellow Gold Flat interwoven design link Ladies Bracelet. Length approx. 190mm and 6mm Wide Flat links Chain design. 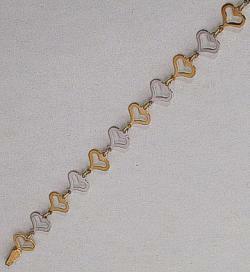 9ct Gold Open Heart design Bracelet in approx. 185mm length. 9 carat Gold in 2 tone colours Hearts Bracelet. 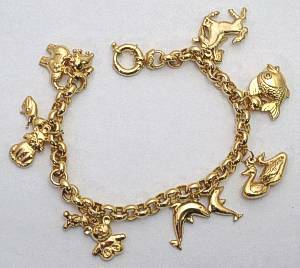 9 carat Gold Large Charm Bracelet with 14 Gold Charms attached. 8 inch (205mm) Large Charm Bracelet. 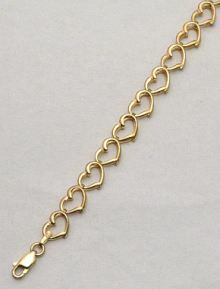 9 carat yellow Gold 190mm length ladies Open Heart bracelet. In-Line Heart design 10mm Wide bracelet with lobster sprung clasp. 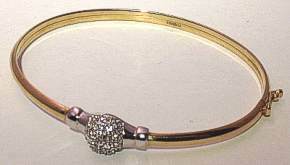 9ct Gold CZ set Glitter Ball design Bangle. 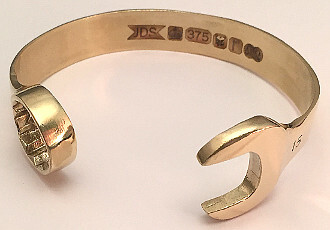 9 carat yellow Gold Large Spanner shape Bangle with feature Hallmarks. Spanner shaped bangle based on 15mm shape Wrench in solid 9ct Gold.